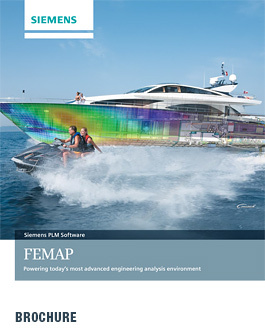 Femap is an advanced engineering simulation software program that creates finite element analysis models of complex engineering products and systems, and displays solution results. Femap can virtually model components, assemblies or systems and determine the behavioral response for a given operating environment. Data surfaces that allow you to create complex loading conditions based on prior analysis output for multi-physics applications. Femap’s open customization capability allows complete access to all Femap functions through an OLE/COM object-oriented Application Programming Interface (API), which employs standard, non-proprietary programming languages. Access to the API is through a development environment within the user interface where you can create custom programs that automate workflows and processes, and which can interact and exchange data with third-party programs such as Microsoft® Word and Excel. Femap is an intuitive Windows®-native application. Femap’s support of multiple graphics windows and specialized panes, such as the Model Info Tree and Data Table, allow complete access to the finite element model and results data and help promote efficient work flows. You can modify the appearance of the interface to suit your requirements, including repositioning panes, modifying the level of functionality exposed, and complete toolbar and icon customization.